The month started with a trip to Columbus, OH to present a few tips to keep the Citrix Consultant away! For Current Citrix Hero Program members- don’t forget we’re talking about PVS and MCS performance Friday, March 22nd from noon to 2 Central US! The Nashville CUGC met on March 15th. It was a great time with my friends from Nutanix joining us. April is going to be a big deal! We will re-open the Citrix Hero Program to the public (get on the waitlist here) April 15th. I’m putting together quite the celebration around it which will have even MORE presentations and fun activities to get excited about! Join our email list for those announcements! We will also be doing a special for Active Directory you won’t want to miss! Why do I always seem to be giving the same advice? Is that such a bad thing? It makes my job easier, right? Are they really that important if people aren’t doing them? 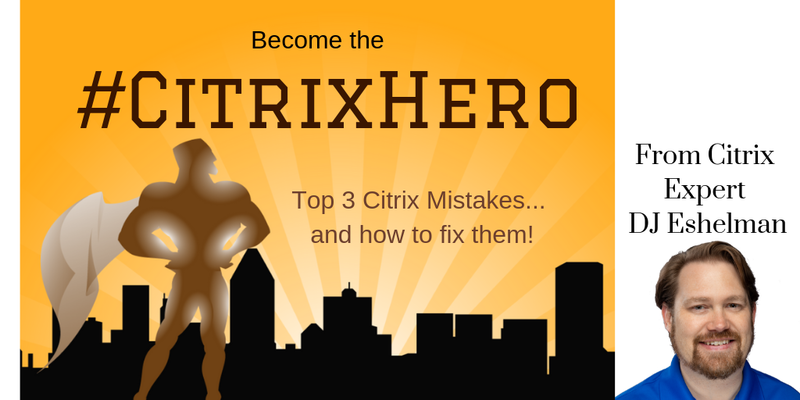 Top 3 Citrix Mistakes – How to Be a #CitrixHero! The goal of this series is to outline some of the more common Citrix Mistakes that I have been seeing in my consulting engagements. These top three were chosen not because of frequency per se, but for the sheer impact they have. I chose them so that when you implement the fixes – you can be the hero. The #CitrixHero. 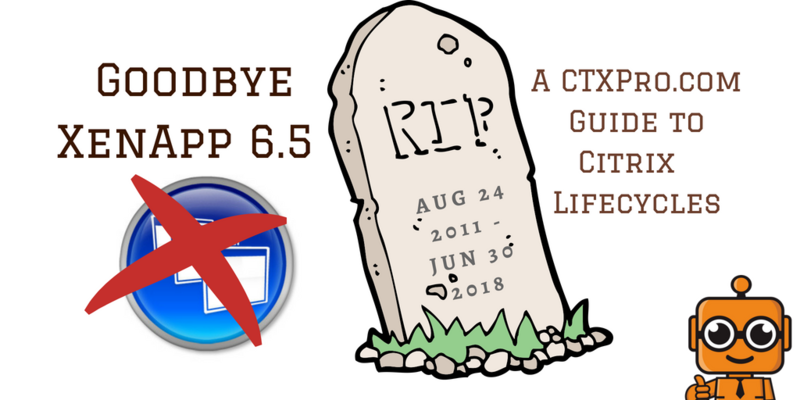 ICYMI: XenApp 6.5 is End of Life. But so is 7.0 to 7.13! Fare the well, XenApp 6.5. Talk about an amazing run! But alas, the product is no more… I’ll break this all down in a moment and what it means for you if you still find yourself running any XenApp version except 7.6 LTSR, 7.15 LTSR or 7.14 to 7.18. June 30th was a big day for Citrix, yet it passed with barely any fanfare. I thought maybe I’d do something about that! So you’ve done a nice job cleaning up your VDA. You’ve optimized, removed extra user profiles and even ran cleanmgr to cleanup your system’s 2 GB+ of old updates. You deploy the image… and get a message that you’ve been logged on with a Temporary Profile. A look at the Event Logs leads you to Event 1511. Here’s what’s going on in most cases. Unfortunately, Citrix has done it again with Citrix Workspace… showing off something pretty cool and adeptly showing off how it works… but not really explaining very well at Synergy how it will be deployed. So I thought I would get some down-to-Earth thoughts together of what’s going on up in the clouds from an Architect perspective. User/Subscriber Layer – This is the users themselves and any peripherals they attach to. It defines how users use a product. Access Layer – This is how access to applications is controlled. In the Citrix world we’re largely talking StoreFront, NetScaler Gateway and if you are still living in 2003, VPN. Resource Layer – This is important! The Resource layer is the… you guessed it, resources the users need access to. Be it Applications hosted on Server OS, VDI Desktops or even SaaS apps. The Resource Layer defines what they are, where they are located and most importantly- how they are structured and maintained. Control Layer – This is what we define in the Citrix world as the components that aggregate and control resources. It includes Active Directory, Databases, Licensing and services such as the Delivery Controller. An important element of the Control layer is policies. Cloud (Hardware) Layer – All these services have to live somewhere, and this layer defines it. Operations Layer – Someone has to maintain all of this- and the Operations Layer is where we define all of this. First off- when we are talking Workspace SERVICE, we are talking about the ‘everything’ subscription. This means it is Apps and Desktops, Enterprise Mobility Management (MDM/MAM), File Sync and Sharing (ShareFile), and Networking (Which now includes both MAS and the Web App Security Service)… but also the Secure Browser service which is NOT included with the XenApp and XenDesktop service. You can find the full list of the checkboxes here. Your mileage may vary of course, but if you are using even two of the ‘core’ services, Workspace makes sense. At an estimated $34.38 per user per month (Beginning prices as of June 11, 2018), Workspace is certainly not cheap… but as far as powering productivity from any location… I have to admit, this is THE premium service to make it happen these days. So what is it giving you? Essentially, we are Hybridizing elements of the Access, Control and Operations Layer. You are still ultimately responsible for maintaining your Resources, regardless of if their location!! This is an important part that is VERY often missed when talking about Citrix Cloud, so please don’t be one of those confused by it! In other words- you still maintain your own Cloud Layer. 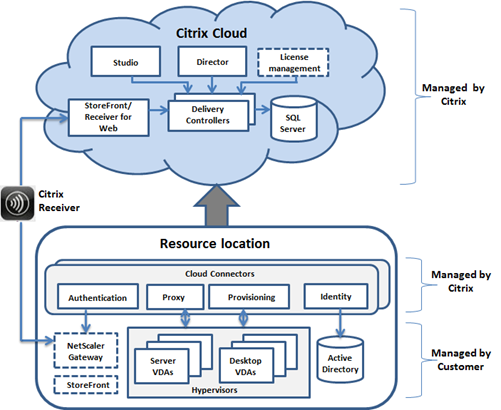 Citrix doesn’t magically start giving you VDI from their cloud. The exception to this is Secure Browser… but that’s a different topic. What is the Workspace App? 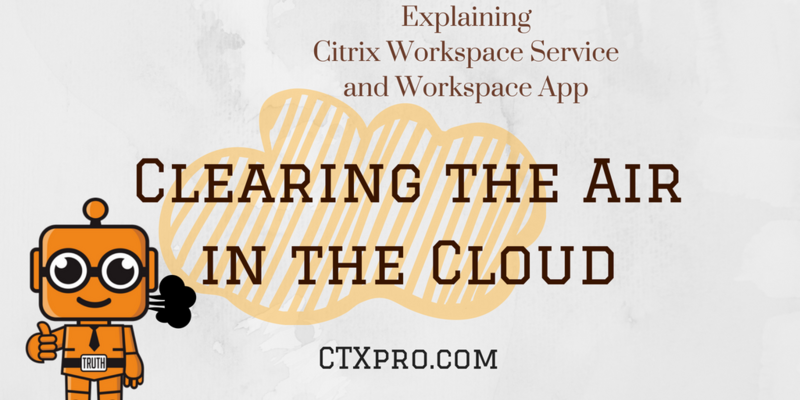 The Citrix Workspace App is the new way of aggregating resources FROM THE WORKSPACE SERVICES. It makes a lot of sense because you can aggregate multiple resources, control mobile enrollment and file management all in one- very nice. But this of course brought up a lot of other questions, which largely are answered here. Note that what was shown at Synergy does require the Workspace Service Premium edition. If you are looking at this and thinking there’s something familiar about it… you’re right. The concept comes from XenMobile’s Secure Hub- but is now brought to other devices as well as mobile. It will be generally available in Q3, with additional features coming in terms of what will happen with the ShareFile Service (that’s a whole other topic). IMPORTANT- Workspace App WILL REPLACE Receiver sometime in Q3! Workspace App is also important because it has significant areas of impact in the User and Access layers. Up until recently it was true that if you have an on-premises (or on-prem, but never on-premise, please) Site or sites already set up, that you had to migrate to Cloud control for your resources if you bought that service. This is no longer true because of Site Aggregation. You’ll be able to run both on-prem services (including local NetScaler Gateway and StoreFront) alongside the Workspace App from the cloud! Danny Feller explains in this video blog that the Workspace service aggregates between both on-prem XenDesktop and Cloud XenApp & XenDesktop Service control planes, using the same unified Workspace App. This capability does NOT exist for existing Cloud XenApp & XenDesktop Service customers, however. To date this has been an enormous barrier to adoption, especially in places where the skillsets already exist to maintain local resources. One thing that has not been talked about yet is how this impacts Multi-Site deployments: If you can install a connector and the account you’re using for logon is valid or federated… you should be able to aggregate multiple resources thru the Workspace App. This is significant for a lot of companies dealing with M&A because it allows at least the User and Access layers to be standardized more while they transition the Resources (typically a pretty huge undertaking). Workspace is better thought of as a concept- where everything comes together. This is what Citrix demonstrated at Synergy with the Workspace App. The concept was that instead of keeping all of these apps up to date in Receiver, Sync, etc you could have one app that aggregates both Citrix-Hosted and SaaS apps. People LOVED this concept, I think especially a lot of the administrators and engineers in attendance. And you know what- I get it. Less to maintain? Serviced in the Cloud so it can be managed from anywhere without all the outages? It makes sense. But this concept needs to be broken out a bit because it still confuses especially those of us who have been deploying on-prem resources for over two decades that aggregate cloud resources on occasion. Now we’re being asked to flip the concept and use the cloud to aggregate on-prem??? Refresher- What is Workspace Service? Put simply, any Citrix Cloud service is merely taking what was an on-prem Control mechanism and moving it to the Cloud as a service instead of as a VM. So Citrix merely provides you with a console to manage the polices and settings, you don’t need to maintain VMs. 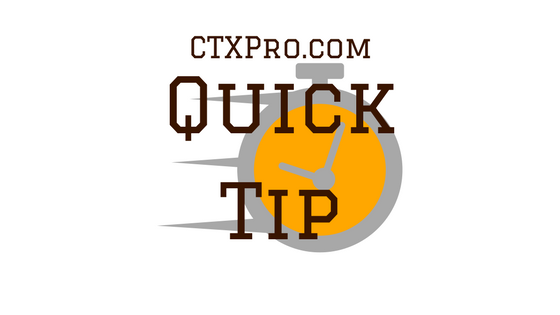 As for connecting to your cloud locations for resources, this is done via a Cloud Connector- a universal software that sits on a Windows server in your cloud to create an SSL connection to the Citrix Cloud. This has the added benefit of eliminating VPN and Firewall needs. The connector acts as a bridge between specific services within the Citrix framework only. Citrix doesn’t need VPN access to your network; it only sees what you allow the Cloud Connector to see (DNS and Active Directory, along with the Citrix Resources). As far as the Service itself? That’s what you pay for – whatever service you are consuming. In the case of Workspace Service- remember that it is the inclusion of all the primary Cloud services. If that is too much or not needed- there are other Services to which you can subscribe. Keep in mind that Citrix uses a monthly per-user figure for pricing, but you typically need to pay for at least a year in advance. I probably shouldn’t even be talking about Workspace Suite because it’s essentially dead IMO, but the concept was the same- a bundled license of products which in this case included some cloud-based components; but your Resources and Control for Apps and Desktops remained in your cloud exclusively. Platinum is still the best fit for most customers who push the edge of what can be used because it includes a boatload of useful stuff which I would get tired trying to go thru in detail. But for those that needed XenMobile as well as Platinum it made sense. In other words- don’t get it twisted: same name but very different functionality. The Workspace Service is much more all-inclusive and offers you the ability to run the control plane from the cloud. With Workspace Suite you administer both Control and Resource Layers. What does all this mean to the average Enterprise customer? Very little… for now. If I’m being honest – in my travels out in the world, most customers on Enterprise licensing aren’t even fully taking advantage of what can be done with what they have. I’m actually doing some private research on this and what I’m finding is that some are even aware of benefits their licensing already has such as AppLayering and Workspace Environment Manager… but they are not utilizing them at all! When I’ve dug into ‘why’ this is happening, in almost every case I’m finding that there was either simply no awareness of the entitlement or in more cases there simply isn’t the time or HR capital to manage said features. This is a shame because they are already paying for it. Now, I’ve begun addressing the problem as I can by launching a membership site where people can keep up to date and learn more about these kinds of things (and you should totally check it out!). But I will admit this: Moving the Control and integration of these features to the Citrix Cloud makes a lot of sense. All Administrators will have to learn is how to use the consoles. Engineers will simply need to learn how to make it all fit together without having to do much of the grunt work, freeing them up their 1,713 other tasks. This has impacts on your Operations Layer! But you are essentially exchanging one cost for another… So is it valuable in that regard? Probably. But time will tell if we see any real movement there. Why? THIS IS TOO EXPENSIVE! Well- I mean, sort of. In truth, it really isn’t when you look at what you are getting. But if you are not taking advantage of the features, then it totally is not worth it. That being said- if your organization doesn’t have the ability to fully support a mobile workforce both in the cloud and on-prem… this may be worth taking a look… when you’re ready. I’m not a fan of buying things because they are shiny. You really need to understand what you are getting! That said- be mindful of your spend on this- especially around upgrade season. If you are running 50 users and have no admin staff… does maintaining on-prem really make sense? Are you really getting the value out of it? From what I’m seeing in the field right now I’d have to say no; but there is still resistance to the price point. It’s a quandary for sure! But consider this: I recently helped a customer with their upgrade to 7.15 LTSR. You know what took the longest? Dealing with their database issues! It added a whopping 10 hours of effort onto what should have been a relatively simple upgrade. So I decided to look at more of these upgrade projects. Another with issues with Windows services that disrupted the controller services. 20 hrs of effort. Another that had some massive issues with about every member of the Control layer… 80 hours of effort! Another with an issue of a sudden departing Citrix lead right before a major go-live- 80 hours + a few hundred more I couldn’t catalog. The vast majority would have been avoided, which is sad. The reality is that the skillsets aren’t there any more- hiring qualified Citrix help is extremely difficult right now. This means relying on consultants. So if you are paying someone $200+/hr this can really stack up in a hurry! I think people need to start putting this into their calculations of going to the cloud, because it really does significantly reduce how much you need to spend to maintain the control; you simply need to administrate and upkeep the Resources. Not saying that’s easy- but it’s less work by those needing specific qualifications that are hard to find. That is very significant. So- is your head still spinning? Mine too in some ways. But hopefully using some fundamentals helped in some way. But I want your feedback! I’m considering doing a comprehensive, real-world course that would help better explain the Methodology and what is needed to maintain all of this both if you use Cloud and if you remain On-Prem or do the Hybrid approach discussed here. If you are interested- please contact me and let me know! I encourage you to join the membership site or even our free Facebook Group and chat with your peers and myself about it!